Choosing to breastfeed is one of the most important decisions you can make for your baby; and so is choosing the right breastpump and accessories to support your breastfeeding goals. 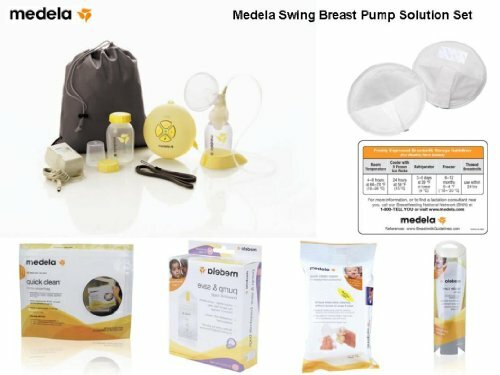 It can be overwhelming with all the options available and as a new mom you may not be sure what is important to get to set you up for success.So Medela has made it easy for you to prepare for breastfeeding and pumping with a convenient all-in-one breastpump and accessory set that also offers helpful education and tips. A convenient all-in-one breastpump and accessory set. Also offers helpful education and tips. Includes Swing Breastpump, 2 breastmilk bottles with lids, drawstring bag & more. 2-Phase Expression technology produces more milk in less time. Medela Accessory Starter Set with disposable bra pads, breastmilk bags and so much more.